Comics In 5 Panels: Not-White Month: Justice League Of America's Vibe. Not-White Month: Justice League Of America's Vibe. Okay, one more request, and that will be the end of Not-White Month. This time: Justice League Of America's Vibe. One heck of a long title, eh? Vibe is one of those characters who died YEARS ago, and most of us has actually forgotten all about, if we even knew he had ever been part of the DCU. So bringing him back to mainstream comics, and even getting him his very own solo-series is quite risky. To bring back a legendary character like Barry Allen is one thing, because even though he died in the 80's, he was still remembered and known by any DC because of his importance in Crisis On Infinite Earths. But what do we remember Vibe for? .... Well, he was... part of the JLA... and that's it. So really, if you want this almost unknown hero to have his own solo-series, you practically HAVE to ad JLA to the title. Here, he gimmick of re-using a name that sells is excused. 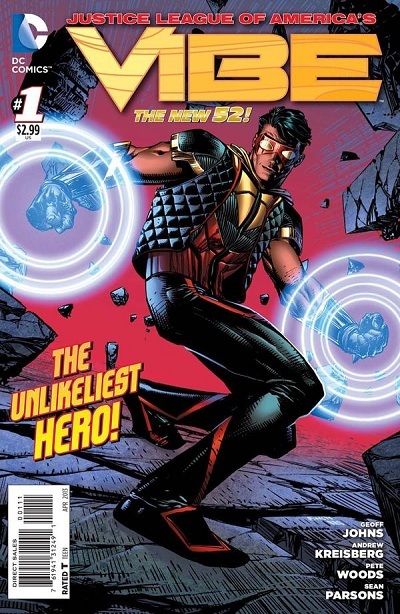 Cisco is a young man, who was saved by his older brother Armando during Darkseid's first invasion. Cisco survived, his brother... became the first victim of many that day. Years later, Cisco learns that he has, due to the magic of science, evolved superpowers from being that close to the dimensional rift that Darkseid used to enter our realm. He can create seismic vibrations and has a sixth sense that allows him to detect visitors from other dimensions. He meets government agent Gunn(get it?) from ARGUS who invites him to join the JLA. Everything seems to be going pretty great for Cisco... Except, this is a superhero comic, and working with the government is ALWAYS a bad idea. Vibe soon finds out that the dimensional travelers that ARGUS sends him to capture may not be the enemies hey want him to believe they are. I am usually a sucker for stories about traveling through dimensions, bu this series seemed kinda... okay. Maybe it was that this 10 issue long series had three writers, but the writing didn't really capture me. Sure, it has some good ideas, like how the Darkseid invasion affected Earth, and Vibe's pretty unique powers, but good ideas is not enough. And I'm honestly pretty tired of "government BAAAD" stories(DC has PLENTY of those), so that's a turnoff right there. But I will compliment the outstanding artwork that brought to this series. So if for no other reason, buy the comic for the great artwork.